ALL DIALOGUE IN ENGLISH. NO SUBTITLES. IN SEARCH OF THE MILITANT CODE is an explorative media production, a short movie for screening, an outtake from a fictive, interactive story world. A combinatory way of using narrative strategies and tools from traditional filmmaking and a computer generated narrative universe. The setting: the 3D modelled world Abadyl with social, political and aesthetical statements and description of characters and lifestyles. In this world a story is enacted, an investigative reporter tries to set up an interview with a female graffiti artist. Two levels of reality: Mix between realistic video shots in real life settings, set design created environments, still images and mobile phone mpeg movies with 3D created textures and animated setups from the world Abadyl. The scenario was originally written by Thore Soneson for the fieldasy exhibition at skanes konst malmo sweden in 2003 and for the Pineapple video bar Michael Johansson made a pilot version of the script and started to investigate if it was possible to create a short movie around the scenario. In the pilot we made a version of the story with video and 3d animation renderings mixed together with voice over and original music by Johan Salo and voice by actor Bo Jonsson. More info on Abadyl, a connected virtual and physical city can be found on http://www.abadyl.lowend.se/. 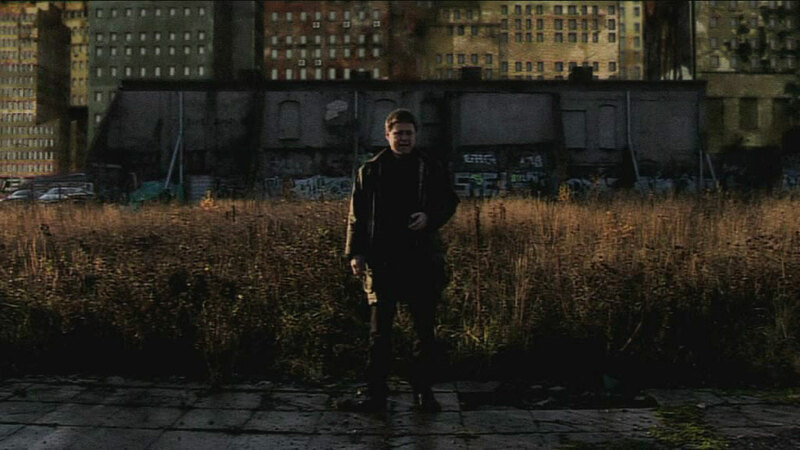 Still from the visual material used in the pilot movie. In modern animated movie production the technical use of green screen sets allows an advanced mix of digitally created environments and effects. In this setting actors act in the blind, on an empty stage. Digital postproduction enables a transformed reality, a classic hollywoodian make-believe but in a brand new costume. In our production we choose another way of working, of mixing the different realities. A sort of visual collage, a patchwork of physical levels shot in real environments combined with 3D created sets and environments from the world Abadyl that is also the setting of the story. Instead of trying to create a computer generated world of make-believe, we chose an abstracted form of reality, more based on art appropriation of reality than on the moving images more documentary relationship with the environment. An enhanced realism. 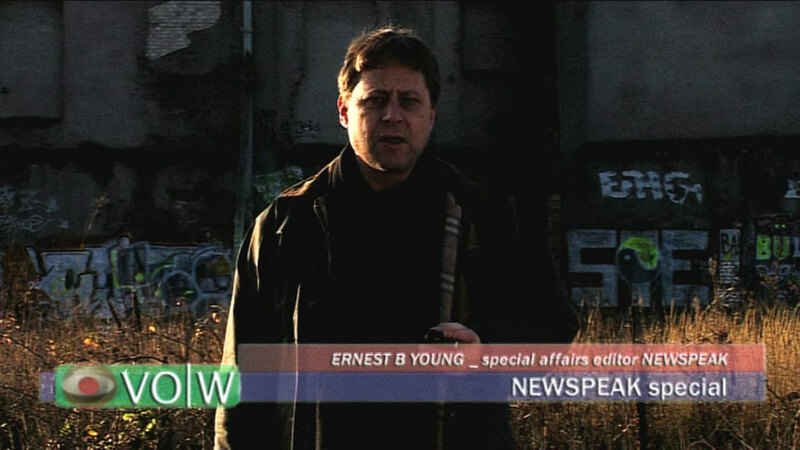 Newseditor Ernest B Young in the animated town ABADYL. In motion picture and computer game realities the creators set up a sort of fictional “contract”, a make-believe scenario that in all its essential parts are a convention based on the Aristotelian dramaturgy. The viewer and audience are absorbed in the fictional world, take part in a dramatic story, intellectually and emotionally. In the form of narrative collage we use in this production, we take the “idea” of a fictional world and put it together by using recognizable elements of realistic video and animated sets. The result is a form of meta-narrative, both in the narrative form and the actual visual form; an aesthetic aimed at creating a level of “believability”. In the pilot we made a version of the story with video and 3d animation renderings mixed together with voice over and original music by Johan Salo and voice by actor Bo Jonsson. Born 1962, Gothenburg, Sweden • Artist/researcher • Educated at the royal college of fine arts in Copenhagen 1984 -1990. I worked with digital media as part of my work practice for over 15 years. I have done about 50 exhibitions both in Sweden an abroad. Since 1999 I have been involved in research at the Interactive institute, Space and virtuality studio, and since 2002 at Malmo University arts and communication.